Total of 2600 produced. Some 1350 were available when war broke out in the Pacific. The Long Lance was the finest torpedo in the world at the start of the Pacific War, and remained so until well after the war ended. It used pure oxygen rather than compressed air as its oxidizer, giving it enormous range and rendering it nearly wakeless. The Japanese Navy conducted extensive tests against hulks prior to the war, a practice neglected by the other powers, and the Long Lance was quite reliable and surprisingly safe to handle once the bugs were worked out. Britain and Japan had both experimented with pure oxygen torpedoes in the early 1920s, but both navies had suffered fatalities from explosions with the experimental devices, and Japan abandoned its efforts in 1924. However, in 1927, a Japanese naval inspector in in Britain reported that the Rodney appeared to be equipped with oxygen-driven torpedoes, and the Japanese renewed their efforts. It was found that sharps turns in the oxygen tubing compressed and heated the oxygen, causing it to explosively react with traces of oil in the tubing. The Japanese eliminated all sharp turns in the oxygen tubing and cleaned the tubing with a strong alkali solution, which solved the problem. Likewise, the tendency for the kerosene and oxygen mixture to violently detonate when first introduced into the combustion chamber was solved by starting the torpedo with compressed air from a "first air bottle" and only gradually switching to pure oxygen. The resulting torpedo engine was so powerful that the Long Lance could be equipped with a larger warhead than those of the other naval powers, while retaining a high speed and remarkably long range. The Navy constructed a specialized 4000-ton press to manufacture the steel air flask for the Type 93. The forward end of the flask, which of necessity was a separate piece, was connected using a copper washer arranged such that the pressure inside the flask held the washer in place, which proved highly reliable for preventing leaks. The first air bottles of the Long Lance and its derivatives had a tendency to leak that was never fully corrected. This did not matter much for the Long Lance itself, since it was not particularly difficult to check and refill the bottles on the deck of a cruiser or destroyer, but it was a significant handicap for the Type 95 submarine torpedo based on the Long Lance, since checking and refilling first air bottles in the cramped spaces of a submarine was an onerous task. The Type 97 midget submarine torpedo was quickly replaced by an enriched air torpedo, the Type 98, which did not require a first air bottle. The torpedo was meticulously tested for depth control by firing it at the sheer sea cliffs of Oshima (139.402E 34.733N), an island south of Tokyo. The Americans did not similarly test the depth control of their Mark XIV torpedo until 1943. The Long Lance used a simple, robust contact detonator, which proved highly reliable. Torpedo technicians in the Imperial Navy were meticulously trained in its maintenance, and and they and their officers were impressed with the need for absolute secrecy regarding its capabilities. The Long Lance was launched from triple or quadruple torpedo tube mounts, with the Type 92 quadruple mount being typical of the most modern Japanese destroyer classes. The Type 92 launched its torpedoes at 40 fps (12 m/s) using compressed air or, in an emergency, black powder. The compressed air launch ensured that Allied ships in night engagements were not aware they under torpedo attack until the first torpedoes hit. The mounts included 3mm (0.118") shields around the warheads to give them light splinter protection. Torpedo depth and gyro angle were set manually using a plunger and handwheel, but running speed could be adjusted only by removing an access plate in the torpedo tube. However, the Japanese rarely used any but the high speed setting operationally. The accuracy figure for the torpedo shows that a Long Lance had only about a 1 in 20 chance of actually hitting a battleship at 14 miles, so the long range seems like an extravagance. However, the Japanese reaction when ambushed at night was to immediately launch shoals of the torpedo in the direction of the enemy. This proved to be a horribly effective tactic in the Solomons. The very large warhead ensured heavy damage when a hit was secured. Few destroyers ever survived a hit from a Long Lance, and even the toughest cruiser could absorb no more than three solid hits before succumbing. Because of the long range and nearly invisible wake of the Long Lance, its existence remained a secret well into the war. Hits from the Long Lance were often attributed to mines or an undiscovered submarine. 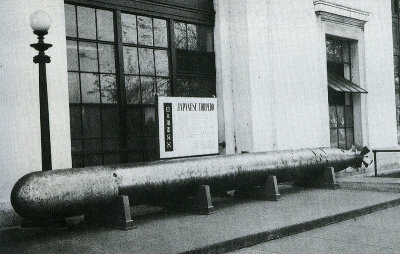 It took the capture of Japanese documents to convince Allied naval leaders that the Japanese had come up with such a capable weapon. An intelligence bulletin accurately describing its performance was not issued until March 1944. The Japanese always referred to this weapon as the Type 93 Model 22 Torpedo. The name "Long Lance" appears to have been an invention of famed U.S. Navy historian Samuel Eliot Morison.